I thought I’d wait till the end of March for a wallflower, but contrary to its usual rhythms March grew colder as the month wore on. Those few intrepid daffodils that joined the snowdrops in the opening wave of spring had barely chance to open before the whole country, to the north of the Trent, was covered in snow. Up in Staffordshire for the last week of the month I was left looking out across the meadows buried in snow, knowing that there was as much chance of finding a flowering wallflower as there was of spotting a brontosaurus tramping through the farmyard. It’s not the first time I’ve been undone by the weather. But for Orwell wallflowers were a definite feature of early spring, along with primroses, daffodils and, of course, the common toad. In the 30s and 40s I don’t doubt that there were gardens full of them by the end of March, but for me, eighty years on in the Staffordshire countryside, there were not a single one to be seen. As always happens with these things, as soon as I stopped looking and March passed by, I found exactly what I was looking for. On a flying trip up to Yorkshire I found a bed full of wallflowers by the bandstand at Filey Bay. But by then my deadline had passed so you’ll have to do with this picture above which was shot (I’d better admit it) in Barton Grange Garden Centre just north of Preston in Lancashire. At the time it was the best I could manage. I’ve been writing here mostly about Orwell, his writing and my travels around England observing the climate. But for now I’m just going to shift onto photography and camera kit. The photo here is taken with a newly acquired lens – a 105mm f2.5 Nikon which is about thirty years old and has to be manually focussed. I bought this lens for £145 about a month or so ago from Greys of Westminster and I’ve been enjoying using it ever since. The general mantra with photographic equipment is that quality lenses on average cameras work far better than average lenses on quality cameras. And for the best lenses you can end up paying enormous sums of money – more than a thousand pounds easily – to get zoom capability, vibration reduction, automatic focusing and so on. All of these are relatively recent innovations that help photographers to work and react more quickly than ever before. And if you’ve got a cheetah charging across a savannah, for example, the ability to lock onto it and take a round of frames in the twilight of a Kenyan evening, is quite useful. It really is. 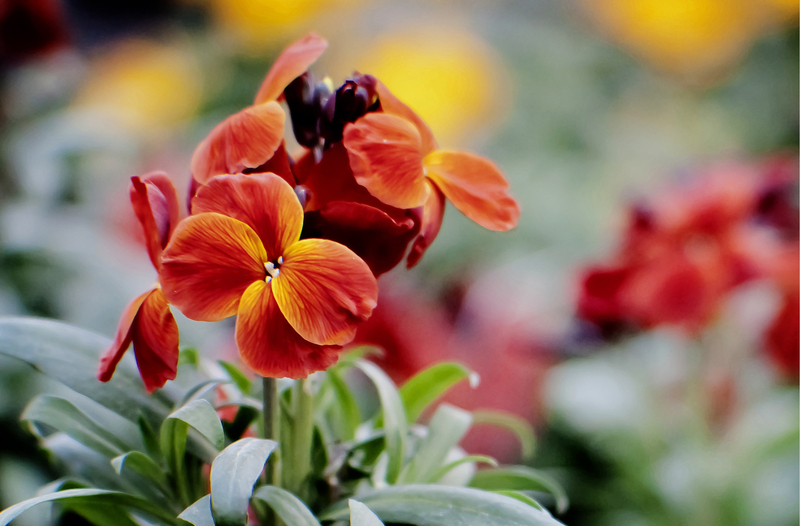 But if you happen to be at a well-lit garden centre in Lancashire and you are taking a shot of a rather sedate subject – a wallflower for instance – then these old manual focus lenses work quite well. In fact this 105mm f2.5 lens has a brilliant reputation among older photographers for its sharpness and superb colour rendition. It’s apparently still used by Aardman Animations the makers of Wallace and Gromit for their films and once you’ve got back into the habit of focussing it yourself you can get some fantastic results. The 105 f2.5 lens in one in a number of old manual focus lenses that can be picked up online or from camera shops for next to nothing. Their optical performance is great but they do give you more work to do as a photographer – either anticipating a shot, taking longer to frame it, or reacting very fast. Here’s a fantastic thread devoted to pictures taken with old manual focus Nikon lenses.